In this work, we report on a detailed high-field EPR investigation of magnetic parameters of deuterated nitroxide radicals dissolved in deuterated frozen solvents of polar or unpolar, protic or aprotic character including ortho-terphenyl, methanol, propanol, glycerol, aniline, phenol, and water. 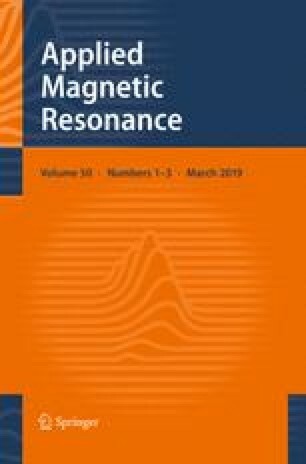 The analysis of the high-resolution W-band (95 GHz) pulsed ELDOR-detected NMR (EDNMR) and 244 GHz cw EPR spectra yielded precise electron Zeeman, gxx, 14N hyperfine, Azz, and 14N quadrupole, Pzz, tensor components, which are most sensitive probes for the microenvironment of dissolved nitroxide radicals. Remarkable changes in the solvation networks were found in the various matrices. The solvent-dependent magnetic parameters of the nitroxide are discussed on the basis of previous semi-empirical and DFT quantum chemical calculations in an attempt to adequately model the nitroxide–matrix interactions. The obtained results demonstrate that the principal values of all the magnetic interaction parameters primarily depend on the nitroxide hydrogen-bond situation and the type of hydrogen-bond donor group of the solvent. The solvent bulk polarity, as described by the static dielectric constant, is of minor importance. Dedicated to Jack H. Freed (Cornell University, N. Y., USA) on the occasion of his 80th birthday. We thank Yuri Grishin (Institute of Chemical Kinetics and Combustion, Novosibirsk, Russia) for enduring technical support and Herbert Zimmermann (Max-Planck Institute for Medical Research, Heidelberg) for providing the deuterated nitroxide radical. We thank Gudrun Klihm (Max Planck Institute for Chemical Energy Conversion, Mülheim) for technical assistance with the 244 GHz EPR spectrometer. This work was supported by the Cluster of Excellence RESOLV (EXC 1069) funded by the Deutsche Forschungsgemeinschaft and the Max-Planck-Gesellschaft. K.M. and M.P. acknowledge sustaining support by the Freie Universität Berlin.